While New York is home to plenty of top chefs, haute-cuisine dominance has long been a grudge match between two French contenders, each recognizable—like Diddy or Prince—by a single name. Though Jean-Georges had the edge for a little while, 2009 has been the year of Daniel. In the past 12 months, Daniel Boulud earned his third Michelin star, graced the big screen in a documentary biopic, refurbished two restaurants, opened another and announced plans to expand to Singapore. 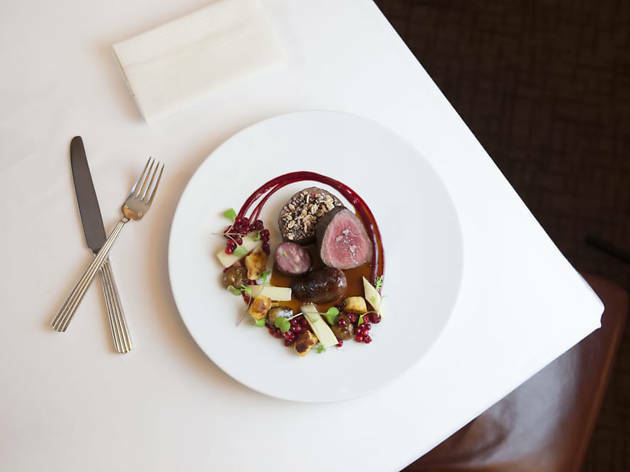 Caf Boulud, located inside the posh Surrey Hotel, is the latest venue to receive a face-lift. Like good plastic surgery, the nips and tucks by Jeffrey Beers are so understated, it’s not immediately clear what’s changed. The designer replaced the carpeting, upholstery, lighting and artwork, but left the dining room’s clubby spirit intact. The overhaul was implemented last August when the well-heeled clientele fled to the beach. It’s more a gift to the regulars than a ploy to drum up business. The place has been an uptown mainstay for more than a decade, a power room with a loyal neighborhood following and its own seating hierarchy at dinner and lunch. In 2008, Gavin Kaysen took over as executive chef. He gave up the top post at El Bizcocho in San Diego to work under Boulud. Though the menu combines the young American’s whimsy with the older Frenchman’s understated refinement, the restaurant remains a reflection of the icon whose name adorns the marquee. Named for the modest caf the Boulud family once ran on its farm near Lyon, France, it serves modern variations on the bistro fare grand-mre might have served there. Cassoulet is the starting point for a far less ponderous dish—bacon-flecked white-bean stew served under a striped bass fillet that’s been anointed with a gratined mixture of bone marrow and porcini dust. This and other nods to convention are listed on the menu—as they have been for years—under the first of four categories (“la tradition”). 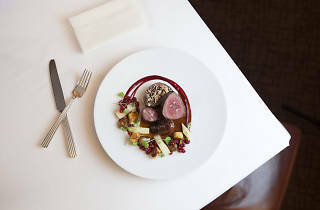 The menu format, which has been essentially the same since Caf Boulud first opened in 1998, can sometimes seem contrived, but it signals to regulars a continuity they’ve come to rely on—codifying the message that this is a restaurant to satisfy a range of palates, cravings and appetites. The market-driven dishes (“la saison”) are more free-form, unified only by their seasonality. Silken vodka-cured salmon is served with tiny potatoes and wispy dunes of rye-bread puree. One complex autumnal entre, a delicious horizontal tasting of veal (crispy sweetbreads, rosy tenderloin, spoon-tender cheeks), features a beautiful medley of Greenmarket veggies (tiny brussels sprouts, caramelized salsify, buttery sweet-potato puree). The equal-opportunity reverence for raw materials makes this a rare French restaurant—French-ish may be more apt—where vegetarians aren’t neglected. In fact, an entire portion of the menu is devoted to meatless cooking (“le potager”), including exceptionally delicate mushroom ravioli filled with chopped hen-of-the-woods specimens, black trumpets and Prigord truffles. “Le voyage,” the final savory category and an expression of Boulud’s travels, is focused these days on the Far East (he opened his first overseas outpost last year in Beijing). Straying too far from his French-cuisine sweet spot, these fine-dining versions of far-flung classics seem mostly designed to save diners the trouble of having to hunt for more authentic originals. Gently seared pot stickers filled with shredded short ribs are too precious to satisfy a real dim sum craving. Those dumplings, and a riff on Peking duck featuring medium-rare breast in a hoisin-orange glaze, were the low points of a recent series of otherwise stellar meals. For certain regulars—the sort who don’t think twice about blowing a few hundred on a low-key Sunday supper (like a recently spotted Mayor Bloomberg)—Chinese at Caf Boulud might make plenty of sense. However, there are better values elsewhere on the menu—not the least of which are offered at the end of the meal. Raphael Haasz, who spent three years at Daniel, produces desserts—an ethereal chocolate, caramel and hazelnut confection; a complex pastry layering chestnut mousse and cassis gele—that are elegant enough to be served in the pricier flagship. Though the diners Caf Boulud attracts may regard the restaurant as an extension of home, for the rest of us, Daniel Boulud’s “more casual” venture—which serves complimentary housemade chocolates and warm madeleines after dessert—still makes an awfully impressive treat. Drink this: The recently opened Bar Pleiades—the restaurant’s unofficial waiting room—is a worthy destination all by itself. Cameron Bogue, a cocktail whiz deserving of the moniker “bar chef,” whips up libations as complex as the cuisine in the restaurant (where they’re also available). Try the subtly sweet Beijing Mule ($15), a tall vodka drink with housemade ginger beer, saffron, yuzu and Asian pear. Sit here: Last year the Wall Street Journal printed an unofficial seating chart for Caf Boulud’s power room. The high-octane tables (coveted by Barbara Walters, among others) line the front windows, while Siberia is along the back wall near the kitchen. Conversation piece: Two years ago Gavin Kaysen competed in the Bocuse d’Or (the culinary Olympics) in Daniel Boulud’s native Lyon. That same year Kaysen vied to become the Food Network’s Next Iron Chef. Chef Aaron Bludorn's jewelbox plating makes every dish that comes out of this kitchen seem like a beautifully wrapped gift. And Bar Pleiades is one of the most underrated cocktail programs in the city.